As much as I love all things girly + feminine, there's something about a tough, relaxed look that I'm totally drawn to. I'm so inspired by beautiful women like Happily Grey + Sincerely Jules that can pull off the most casual, yet incredibly chic look and I find myself going for looks like this more and more. 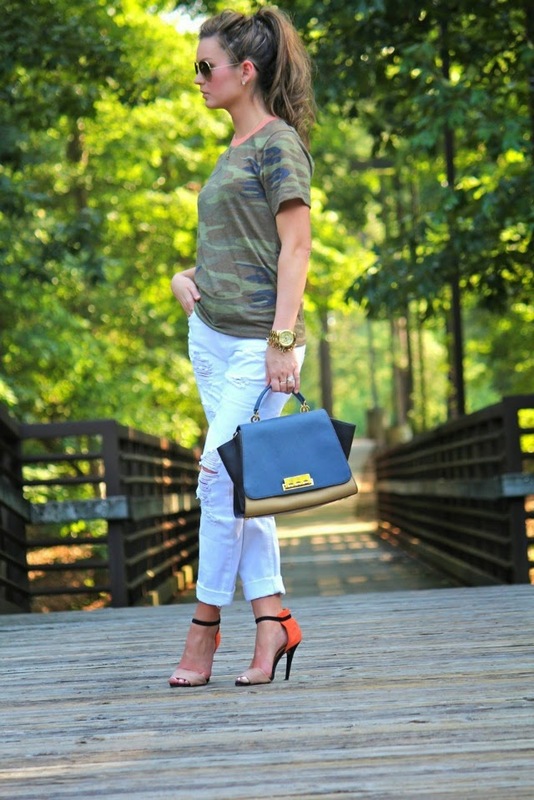 I'm from the south, so camo is pretty much a neutral around here, but of course I had to girl it up a little with heels and a luxurious bag. Speaking of this bag, how perfect is this color for fall? I looove Zac Posen and it's now available at Nordstrom! Love that camo top, especially with the pop of pink in the collar. A perfect way to start pulling in fall elements! I love that top! I have seen it online and was a little weary of how it would look on but this outfit is so cute!! I love how it transitions nicely into fall! I love your hair btw! 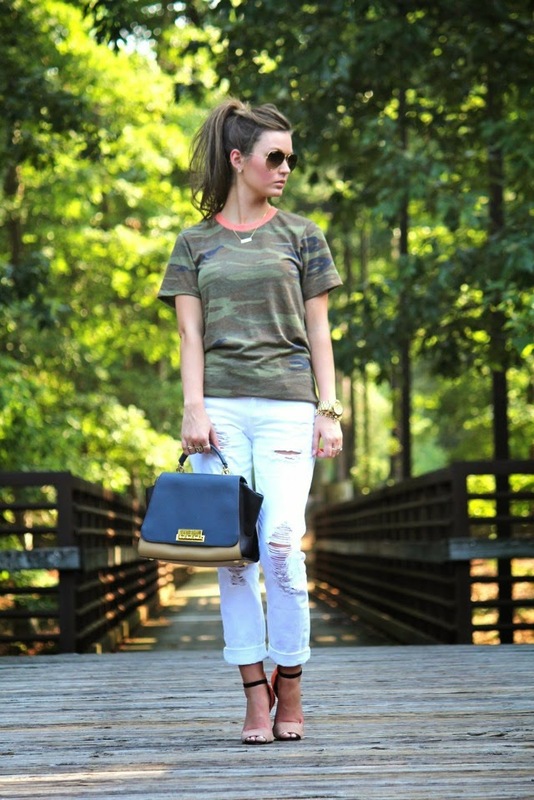 Love that camo tee and it pairs so well with the white distressed denim! Love it! Those purse and shoes are fab! Such a statement outfit, you look amazing! LOVE your hair in a pony! I'd love to know how you style it - it always looks perfect! 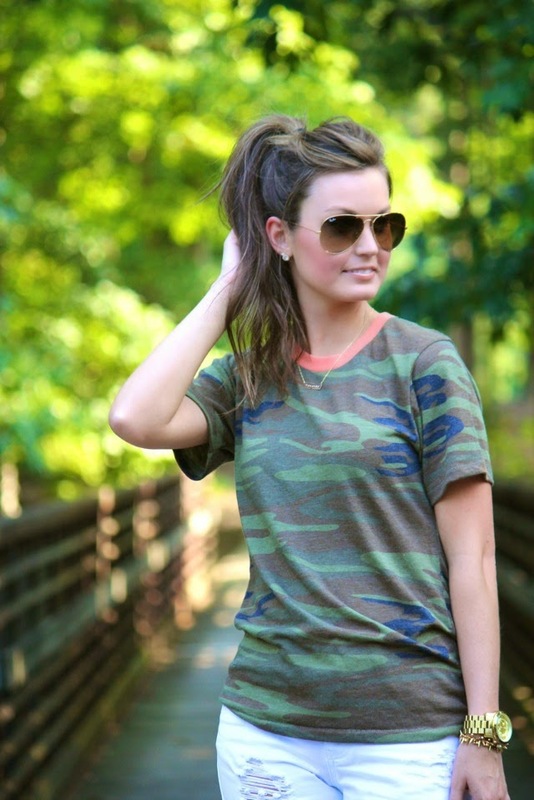 I love dressing up camo just enough that it's still casual...I have some camo capris that I pair with heels all the time and it's one of my fave outfits. Camo will NEVER go out of style, that's for sure.